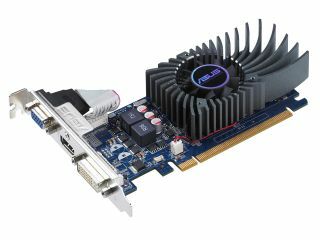 Asus has announced its latest Fermi DX11 graphics card – with the low-profile ENGT430/DI/1GD3 (LP) pitched at home theatre enthusiasts and casual gamers. The ENGT430/DI/1GD3 (LP) – probably know as Eng to its friends – is powered by the Nvidia GeForce GT430. "The Asus-designed PCI-Express 2.0 ENGT430/DI/1GD3 (LP) card is ideal for home theatre enthusiasts and casual gamers," explains Asus' release. "Built using a specially designed low profile PCB (printed circuit board), the Asus ENGT430 includes Nvidia PureVideo engine that accelerates even Blu-ray 3D media. "Its use of the highestquality components, including ASUSDust-Proof fan, GPU Guard, and Fuse Protectionensures that the Asus ENGT430 remains stable and reliable for long-term use." The Asus ENGT430/DI/1GD3 (LP) will be available from 11 October.